Last weekend Jeff Salvage (Racewalk.com), race walking coach and book author, conducted a two-day race walk clinic in Waltham, MA. Jeff covered everything from technique to nutrition, flexibility, and training. The clinic was sold out with attendees ranging across the age spectrum — from 10 years old to over 70. Although most were from New England, some participants came from as far away as Florida, New Mexico and New York. 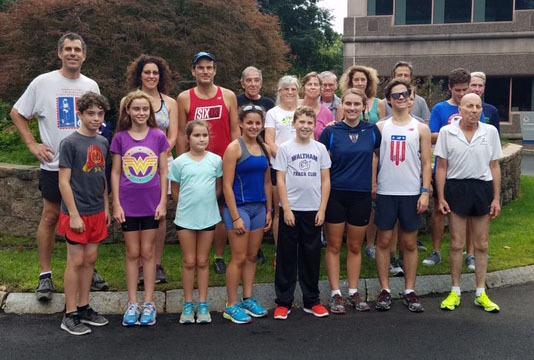 NEW club president Ed O’Rourke hosted the event at his Waltham office, and Ed Vaitones (high school track coach and father of and NEW member Valentina) led stretching and warm up exercises before the participants’ work out. Thank you Jeff Salvage, Ed O’Rourke, and Ed Vaitones for making the clinic a successful event! This entry was posted in Events, Uncategorized by Rich McElvery. Bookmark the permalink.